Contrary to popular belief, Libya, which western media described as “Gaddafi’s military dictatorship” was in actual fact one of the world’s most democratic States. In 1977 the people of Libya proclaimed the Jamahiriya or “government of the popular masses by themselves and for themselves.” The Jamahiriya was a higher form of direct democracy with ‘the People as President.’ Traditional institutions of government were disbanded and abolished, and power belonged to the people directly through various committees and congresses. The nation State of Libya was divided into several small communities that were essentially “mini-autonomous States” within a State. These autonomous States had control over their districts and could make a range of decisions including how to allocate oil revenue and budgetary funds. Within these mini autonomous States, the three main bodies of Libya ‘s democracy were Local Committees, People’s Congresses and Executive Revolutionary Councils. In 2009, Mr. Gaddafi invited the New York Times to Libya to spend two weeks observing the nation’s direct democracy. Even the New York Times, that was always highly critical of Colonel Gaddafi, conceded that in Libya, the intention was that “everyone is involved in every decision…Tens of thousands of people take part in local committee meetings to discuss issues and vote on everything from foreign treaties to building schools.” The purpose of these committee meetings was to build a broad based national consensus. One step up from the Local Committees were the People’s Congresses. Representatives from all 800 local committees around the country would meet several times a year at People’s Congresses, in Mr. Gaddafi’s hometown of Sirte, to pass laws based on what the people said in their local meetings. These congresses had legislative power to write new laws, formulate economic and public policy as well as ratify treaties and agreements. All Libyans were allowed to take part in local committees meetings and at times Colonel Gaddafi was criticised. In fact, there were numerous occasions when his proposals were rejected by popular vote and the opposite was approved and put forward for legislation. For instance, on many occasions Mr. Gaddafi proposed the abolition of capital punishment and he pushed for home schooling over traditional schools. However, the People’s Congresses wanted to maintain the death penalty and classic schools, and ultimately the will of the People’s Congresses prevailed. Similarly, in 2009, Colonel Gaddafi put forward a proposal to essentially abolish the central government altogether and give all the oil proceeds directly to each family. The People’s Congresses rejected this idea too. One step up from the People’s Congresses were the Executive Revolutionary Councils. These Revolutionary Councils were elected by the People’s Congresses and were in charge of implementing policies put forward by the people. Revolutionary Councils were accountable only to ordinary citizens and may have been changed or recalled by them at any time. Consequently, decisions taken by the People’s Congresses and implemented by the Executive Revolutionary Councils reflected the sovereign will of the whole people, and not merely that of any particular class, faction, tribe or individual. The Libyan direct democracy system utilized the word ‘elevation’ rather than‘election’, and avoided the political campaigning that is a feature of traditional political parties and benefits only the bourgeoisie’s well-heeled and well-to-do. Unlike in the West, Libyans did not vote once every four years for a President and local parliamentarian who would then make all decisions for them. Ordinary Libyans made decisions regarding foreign, domestic and economic policy themselves. Several western commentators have rightfully pointed out that the unique Jamahiriya system had certain drawbacks, inter alia, regarding attendance, initiative to speak up, and sufficient supervision. Nevertheless, it is clear that Libya conceptualized sovereignty and democracy in a different and progressive way. Democracy is not just about elections or political parties. True democracy is also about human rights. 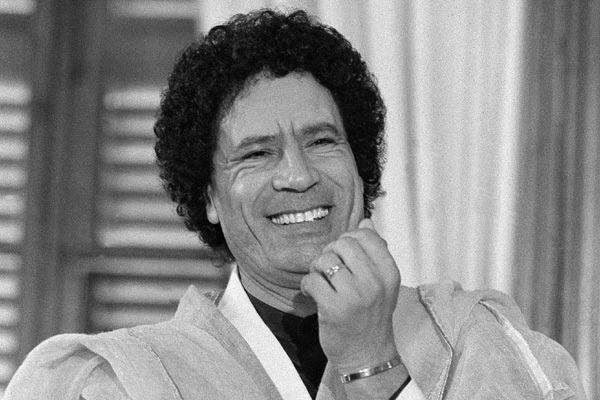 During the NATO bombardment of Libya , western media conveniently forgot to mention that the United Nations had just prepared a lengthy dossier praising Mr. Gaddafi’s human rights achievements. The UN report commended Libya for bettering its “legal protections” for citizens, making human rights a “priority,” improving women’s rights, educational opportunities and access to housing. During Mr. Gaddafi’s era housing was considered a human right. Consequently, there was virtually no homelessness or Libyans living under bridges. How many Libyan homes and bridges did NATO destroy? One area where the United Nations Human Rights Council praised Mr. Gaddafi profusely is women’s rights. Unlike many other nations in the Arab world, women in Libya had the right to education, hold jobs, divorce, hold property and have an income. When Colonel Gaddafi seized power in 1969, few women went to university. Today more than half of Libya ‘s university students are women. One of the first laws Mr. Gaddafi passed in 1970 was an equal pay for equal work law, only a few years after a similar law was passed in the U.S. In fact, Libyan working mothers enjoyed a range of benefits including cash bonuses for children, free day care, free health care centres and retirement at 55. Democracy is not merely about holding elections simply to choose which particular representatives of the elite class should rule over the masses. True democracy is about democratising the economy and giving economic power to the majority. Fact is, the west has shown that unfettered free markets and genuinely free elections simply cannot co-exist. Organized greed always defeats disorganized democracy. How can capitalism and democracy co-exist if one concentrates wealth and power in the hands of few, and the other seeks to spread power and wealth among many? Mr. Gaddafi’s Jamahiriya however, sought to spread economic power amongst the downtrodden many rather than just the privileged few. Prior to Colonel Gaddafi, King Idris let Standard Oil essentially write Libya ‘s petroleum laws. Mr. Gaddafi put an end to all of that. Money from oil proceeds was deposited directly into every Libyan citizen’s bank account. One wonders if Exxon Mobil and British Petroleum will continue this practice under the new democratic Libya ? Democracy is not merely about elections or political parties. True democracy is also about equal opportunity through education and the right to life through access to health care. Therefore, isn’t it ironic that America supposedly bombarded Libya to spread democracy, but increasingly education in America is becoming a privilege not a right and ultimately a debt sentence. If a bright and talented child in the richest nation on earth cannot afford to go to the best schools, society has failed that child. In fact, for young people the world over, education is a passport to freedom. Any nation that makes one pay for such a passport is only free for the rich but not the poor. Under Mr. Gaddafi, education was a human right and it was free for all Libyans. If a Libyan was unable to find employment after graduation the State would pay that person the average salary of their profession. For millions of Americans health care is also increasingly becoming a privilege not a right. A recent study by Harvard Medical School estimates that lack of health insurance causes 44,789 excess deaths annually in America . Under Mr. Gaddafi, health care was a human right and it was free for all Libyans. Thus, with regards to health care, education and economic justice, is America in any position to export democracy to Libya or should America have taken a leaf out of Libya ‘s book? Muammar Gaddafi inherited one of the poorest nations in Africa . However, by the time he was assassinated, Libya was unquestionably Africa ‘s most prosperous nation. Libya had the highest GDP per capita and life expectancy in Africa and less people lived below the poverty line than in the Netherlands . Libyans did not only enjoy free health care and free education, they also enjoyed free electricity and interest free loans. The price of petrol was around $0.14 per liter and 40 loaves of bread cost just $0.15. Consequently, the UN designated Libya the 53rd highest in the world in human development. The fundamental difference between western democratic systems and the Jamahiriya’s direct democracy is that in Libya citizens were given the chance to contribute directly to the decision-making process, not merely through elected representatives. Hence, all Libyans were allowed to voice their views directly – not in one parliament of only a few hundred elite politicians – but in hundreds of committees attended by tens of thousands of ordinary citizens. Far from being a military dictatorship, Libya under Mr. Gaddafi was Africa ‘s most prosperous democracy. About the author: Garikai Chengu is a fellow of the Du Bois Institute for African Research at Harvard University. Click here to mail him.